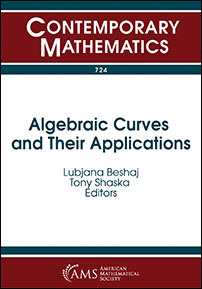 This volume contains a collection of papers on algebraic curves and their applications. While algebraic curves traditionally have provided a path toward modern algebraic geometry, they also provide many applications in number theory, computer security and cryptography, coding theory, differential equations, and more. Papers cover topics such as the rational torsion points of elliptic curves, arithmetic statistics in the moduli space of curves, combinatorial descriptions of semistable hyperelliptic curves over local fields, heights on weighted projective spaces, automorphism groups of curves, hyperelliptic curves, dessins d'enfants, applications to Painlevé equations, descent on real algebraic varieties, quadratic residue codes based on hyperelliptic curves, and Abelian varieties and cryptography. This book will be a valuable resource for people interested in algebraic curves and their connections to other branches of mathematics. Graduate students and research mathematicians interested in algebraic geometry, cryptography, and elliptic and hyperelliptic curves.